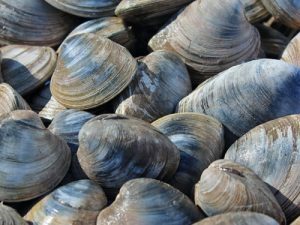 The Rhode Island Department of Environmental Management (DEM) recently announced a new, mandatory education and certification program for everyone who commercially harvests and lands shellfish in Rhode Island. Certification may be obtained by completing a 30-minute online tutorial, available on DEM’s website, or by attending a group presentation offered by DEM. Pre-registration for the group sessions is not required, and additional presentations may be scheduled, as needed. In accordance with United States Food and Drug Administration requirements and new regulations adopted by DEM, holders of all applicable commercial licenses and landing permits for 2018 must obtain certification via the new program. The certification requirement applies to both license/permit renewals and new licenses/permits, beginning in 2018. All certificates are valid for five years, after which re-certification will be required. All new shellfish license/permit applicants must obtain certification prior to the issuance of the new license or permit. All applicable 2018 license permit renewals will be processed during the December 2017-February 2018 license renewal period, even if certification has not yet been obtained. However, all such holders of renewed licenses/permits must obtain their certification by April 6, 2018. Any applicable license/permit holder who fails to become certified by April 6, 2018 will be notified regarding the deficiency. Failure to comply by that date may result in license/permit suspension. A separate education and training program, administered by the RI Coastal Resources Management Council, applies to the certification and licensing of all commercial shellfish aquaculturists in Rhode Island. For more information or questions about the new certification program, contact Bob Ballou in the DEM Director’s Office at Robert.ballou@dem.ri.gov or by phone at 401-222-4700 ext. 4420. For more detailed information on all requirements and exceptions pertaining to this program, see DEM’s Regulations Governing Education Certification for Commercial Shellfish Harvesters. This program is part of Rhode Island’s Shellfish Initiative. To learn more about the mission and goals of the Shellfish Initiative, please visit http://www.shellfishri.com/ri-shellfish-initiative/.